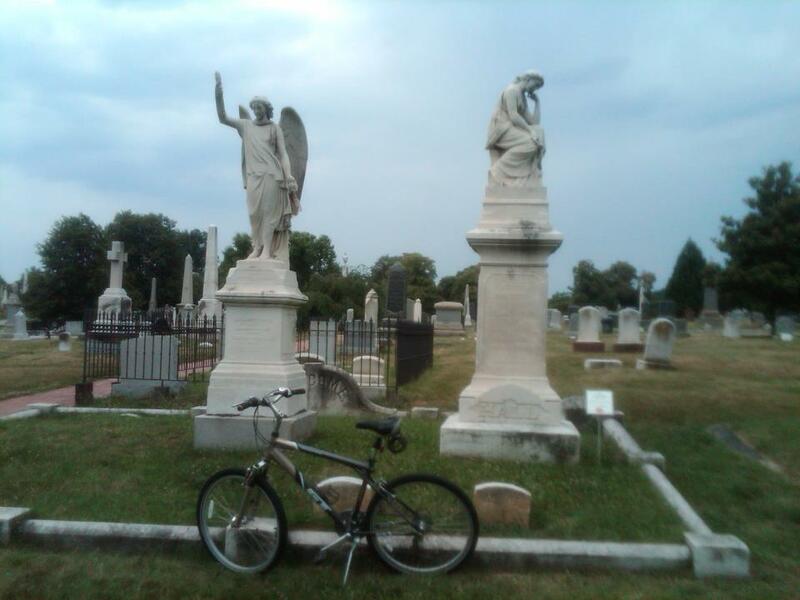 On this bike ride I rode to one of D.C.’s brothels, which are also sometimes known as a bordellos, dens of iniquity, houses of ill repute, cathouses, houses of ill fame, bawdy houses, call houses, houses of assignation, and houses with red doors. However, it was closed. Actually, it closed well over a hundred years ago, but I stopped by the location where it once stood. Despite being single and in just her early twenties, Mary Ann Hall settled, started a business, saved her money, and eventually built a large, three-story brick home at 349 Maryland Avenue (MAP) in the downtown area of southwest D.C., about four blocks west of the U.S. Capitol Building. A 19th century entrepreneur, Mary Ann ran a successful brothel from the 1840s through the 1880s at this address, which was located on the site where the National Museum of the American Indian is currently located. During a time when D.C. was largely devoid of economic opportunities for single women, Mary Ann’s business was very successful. Of the 450 registered brothels in D.C. employing almost 5,000 prostitutes during the Civil War (with several thousand more in Georgetown and Alexandria), Mary Ann employed far more prostitutes than any other brothel in the city, and was the most successful. It was also considered one of the finer establishments of its kind in D.C.
Life was good for Mary Ann. From everything that is known about her, she enjoyed a varied and nutritious diet, including substantial amounts of meat, poultry and fish, as well as exotic fruits like coconuts and berries, foods which were for the most part unavailable to most people at that time. She was also known to enjoy large quantities of French Champaign, and often vacationed at her summer home in Virginia’s “Alexandria County,” which is present-day land in Arlington where Marymount University is now located. Mary Ann died where she lived her life here in D.C. in 1886 at the age of 71. She never married nor had children, and because she had no heirs, a family feud erupted over her estate. It is because of this that we have a detailed account of Mary Ann’s possessions. D.C. court records show that at the time of her death, Mary Ann had no debts and was worth well over two million in today’s dollars. The records also show a list of her belongings, which included Belgian carpets, oil paintings, an ice box, numerous pieces of red plush furniture, as well as an inordinate number of sheets, mattresses, blankets, feather pillows and comforters. 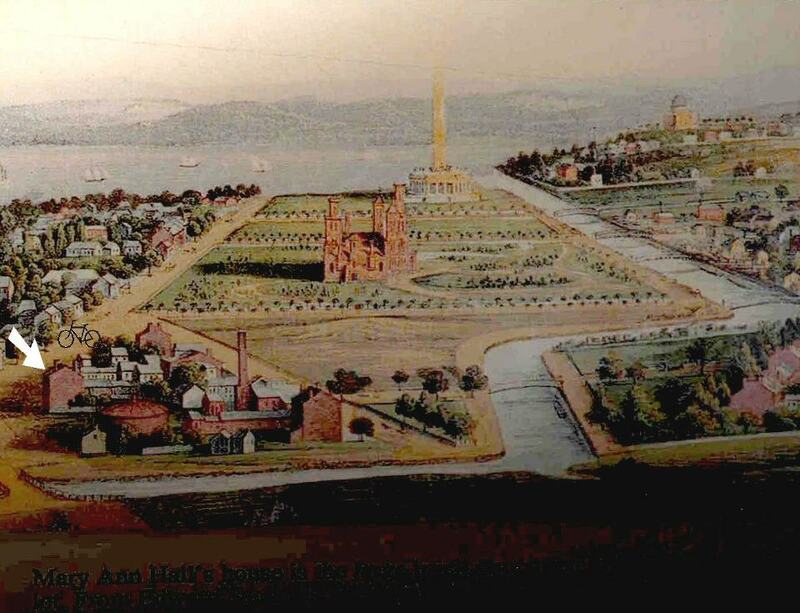 When Mary Ann’s mother died in 1860, she was buried in Congressional Cemetery, where previously only members of Congress had been allowed to be buried. Mary Ann’s highly ranked political connections from the brothel arranged for this. When Mary Ann died six years later, she was also buried at Congressional Cemetery, near her mother, as well as her sister and other family members, at a family plot marked by “large and dignified” memorials. 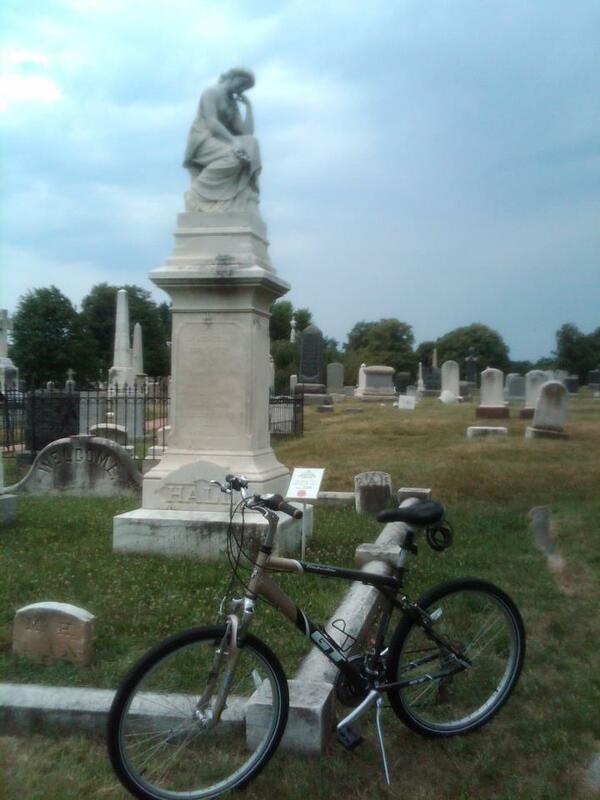 So on today’s bike ride, I also stopped by Historic Congressional Cemetery (MAP) to visit her gravesite, located in section 67, not far from FBI Director J. Edgar Hoover’s grave. There are no known photographs to know exactly what Mary Ann looked like. And she didn’t keep a diary or write a memoir, nor did she leave a collection of personal or business correspondence, so that we could know her personality. 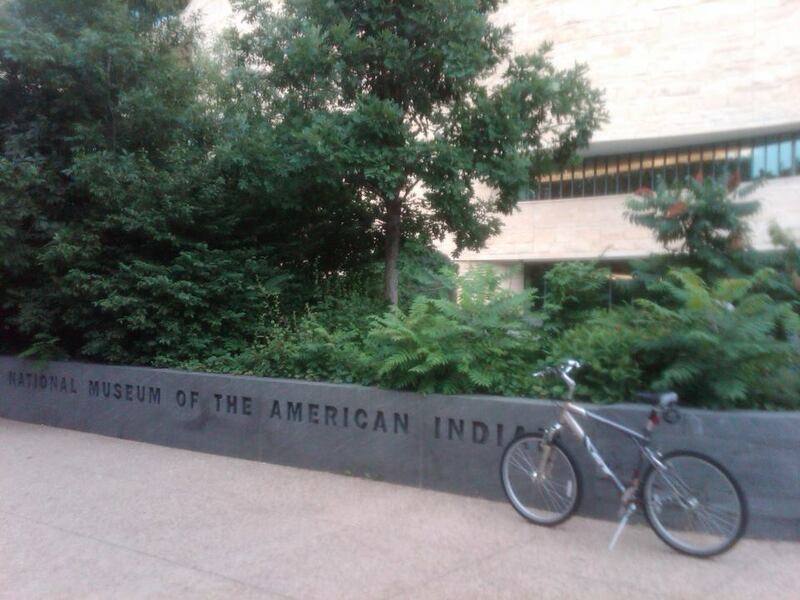 What is known about Mary Ann was learned from court records, census bureau documents, newspaper articles, and an archeological analysis of the area where her home once stood when it was excavated in 1999 so that the American Indian Museum could be built. 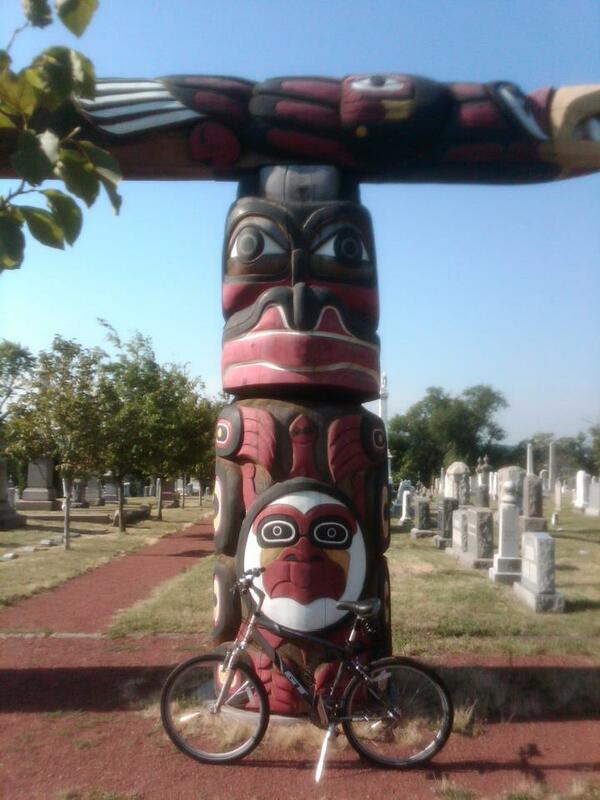 An American Indian named Jewell Praying Wolf James took it upon himself to carve a series of totem poles after the September 11, 2001, terrorist attacks. They were created as a healing gift on behalf of all Native American tribes. 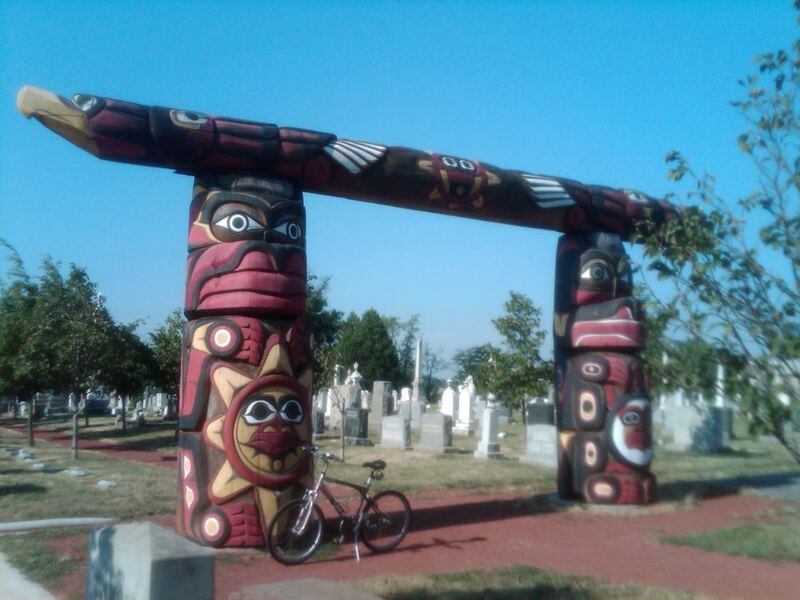 The totems were subsequently dedicated by the Lummi tribe of Washington state as a tribute to those who died in the attacks, and installed in New York and Pennsylvania, and at the Pentagon, the scenes of the crash sites on that fateful day. The totem at the Pentagon was dedicated during the opening week of the National Museum of the American Indian in September 2004. 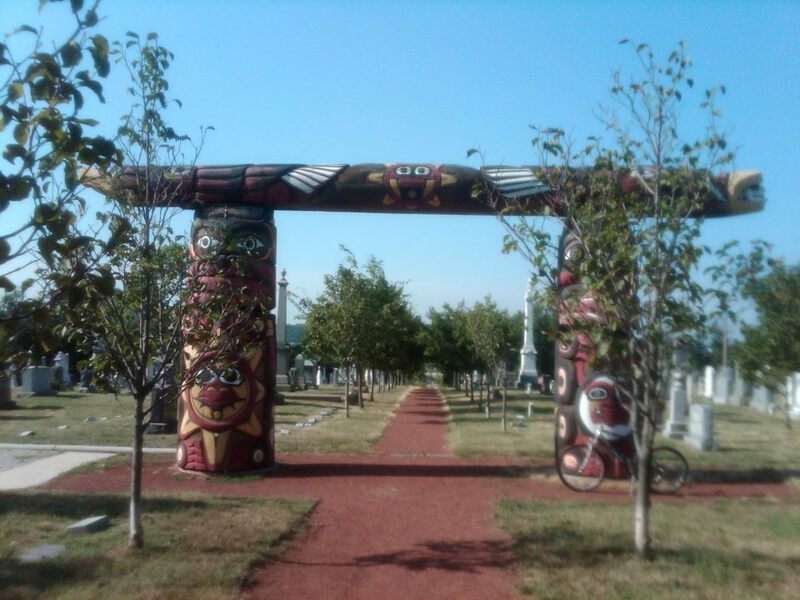 The Piscataway tribe also participated in the totem’s dedication, as they originally owned the land where the totem now stands. It was later moved to the Historic Congressional Cemetery, which is located on Capitol Hill in southeast D.C. at 1801 E Street (MAP). Carved from a single tree from Alaska, the structure lies near a grove of trees in the cemetery that were planted in memory of the victims in the 9/11 attacks. Standing 14 feet tall and six feet around, the two vertical poles are named Liberty and Freedom. The Liberty pole depicts a female bear with a “grandmother moon” in her abdomen. The Freedom pole depicts a male bear with “grandfather sun.” The 36-foot Sovereignty crossbar joining the two poles has eagles carved on each end, with two sets of seven feathers representing American Airlines Flight 77, the flight that crashed into the Pentagon. The female eagle symbolizes peace, and the male symbolizes war. 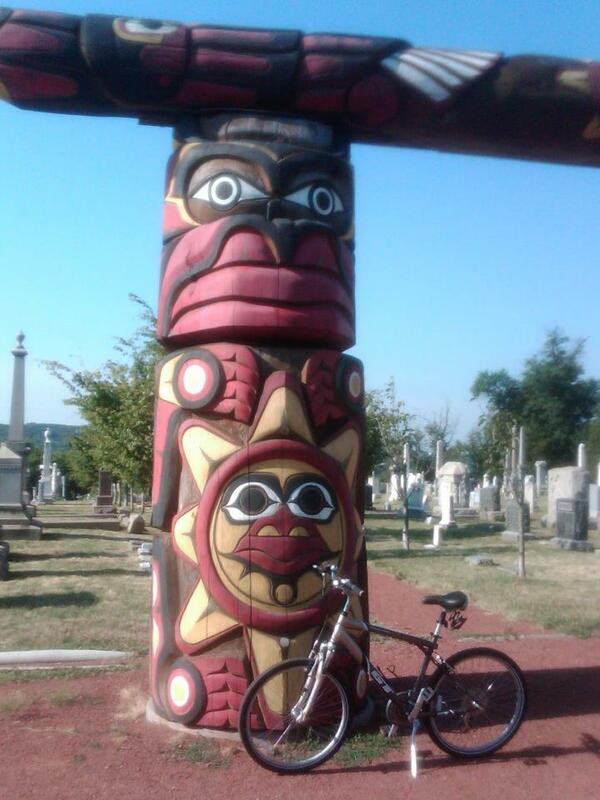 The totem at Congressional Cemetery is eventually going to be moved to the September 11 Memorial Grove that is planned for Kingman Island in the Anacostia River in D.C. But for now, the pole remains at the cemetery, where it may remain for years to come.